It is a tremendous honour to be talking to you today. 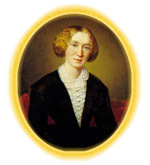 When I first started work on my biography of George Eliot back in 1993 I never imagined that I would one day be celebrating her birthday with the people to whom her life and work mean so much, the members of the George Eliot Fellowship. Of course, when I began my research all those years ago, I knew that I would be learning about one of the greatest literary artists of the nineteenth century. But what I hadn't anticipated was just how modem and relevant George Eliot's work would turn out to be to the way we live now, in the closing weeks of the twentieth century. Only last week I saw an advertisement in the Times Higher Education Supplement which used Eliot's suggestion that 'the strongest principle of growth lies in human choice' as a way of plugging a particular brand of computer software. Banal and even tasteless though this hi-jacking of Eliot's moral authority might be, it does suggest how powerfully her work resonates in our own time. For while Eliot's fiction was written well over a century ago, its subjects and sensibilities strike me as absolutely modem. Indeed, in those eight sublime novels, which stretch from Scenes of Clerical Life to Daniel Deronda, Eliot deals with nothing less than the universal business of being human. Take Scenes of Clerical Life, her first piece of fiction. Amos Barton is a man whom we have all met, a man who doesn't realize how much he loves his wife until it is almost too late. And then there's Caterina Sarti, a girl who can' t help pursuing a man who is bad for her, even though a far kinder and more appropriate suitor is standing in the wings. And what could be more contemporary than the story of Janet Dempster, a woman struggling with both a violent husband and her own dependence on alcohol?